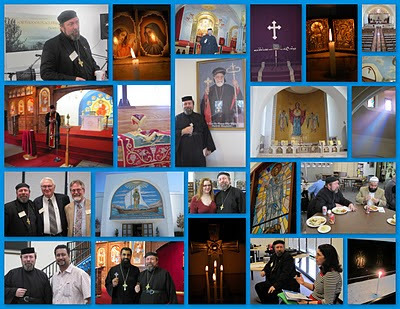 Fr John Brian and Kochamma were honored with the opportunity to pray and light candles at Orthodox Churches in the Los Angeles area at the end of September and beginning of October 2010. Fr John Brian was asked to speak at the Orthodox Peace Fellowship conference at St Paul's Greek Orthodox Church in Irvine where they attended Great Vespers and were able to venerate the relics of the Holy Unmercenary St Panteleimon and St Kyriakos. They also visited the newly consecrated St. Thomas Malankara Orthodox Syrian Church in Whittier where Fr John Brian said evening prayers. Mathew Varghese and his son were angels who blessed their visit. Blessed by an opportunity to visitSt. Leon Armenian Orthodox Cathedral and St. Ephrem Syriac Orthodox Cathedral, both in Burbank, they lit candles. Fr. Kyrillos was the gracious host for memorial prayers at St. Marina Coptic Orthodox Church in Irvine/Santa Ana. Pictured above are a few photos of the Orthodox churches and some of the new friends made durign the visits and the conference. They also visited other religious sites while site-seeing, including a few of the Cailfornia Missions outside Los Angeles and Mary of Angels Catholic Cathedral downtown.